Student protesters during the 2016 Take Back the Night annual march. The University has initiated new proactive measures to combat sexual violence as the issues becomes increasingly important for students. As powerful man after powerful man was brought down in late 2017 by rocking accusations of sexual misconduct, Northwestern students stood mostly idle amid the outrage. Though sexual misconduct on college campuses had been an ongoing concern, it lacked the same national attention as other parts of the #MeToo movement. While many students were committed to ending sexual violence — which they surely demonstrated after reports of misconduct at fraternities made earlier that year sparked fervor among the community — the movement to end sexual assault and harassment against women in the workplace had not yet fully reached Northwestern. Then came a remarkable letter. In one of the closest episodes to the NU community, former Medill students and employees — apparently motivated by what was by then a broad national movement — detailed accusations of inappropriate behavior by one of the University’s most renowned professors. “This is Medill’s #MeToo moment,” declared the letter, which claimed former director of the Medill Justice Project Alec Klein engaged in harassment and predatory behavior. Much of the student body had already been rattled by the University’s decision to not discipline the Sigma Alpha Epsilon fraternity, which an anonymous report claimed was the site of drugging and sexual assault. With the inevitable return of SAE, the confirmation of a Supreme Court nominee who faced sexual assault allegations and perhaps a delayed reaction to the University’s July announcement that it could not publicly confirm the accusations against Klein, students are becoming increasingly active in combating sexual violence. “Given the increased media attention towards the issues of sexual assault, concerns that have been prevalent for years are now coming to the forefront,” said Serene Singh, executive director of Sexual Health and Assault Peer Educators. As the #MeToo movement approaches its one-year anniversary, the student body has galvanized to combat sexual violence and misconduct. At a community dialogue with administrators last week, students in attendance discussed at length their concerns and pleaded for University action. In response to questions about the University’s approach to addressing the issue, Sarah Wake, the interim associate vice president for equity, announced several new measures aimed at prevention. “We are trying to do more proactive outreach, and not just reactive to things, but really get out in front of the community and talk about places where we can go,” she said. But many in the room expressed discontent, ending in a tense back-and-forth between Kelly Schaefer, the assistant vice president for student engagement, and a student who was unsatisfied with Schaefer’s response to her concerns. The community dialogue was the first test for administrators, who many feel are out of touch with students. Only time will tell whether its new initiatives, including a sexual assault prevention task force and annual student sexual misconduct training, will leave students content. “This issue will be adequately addressed when victims of sexual assault feel comfortable reporting and then after that is achieved, we should get to a point where there are zero sexual assaults at Northwestern,” Sky Patterson, the Associated Student Government president, said on behalf of herself and ASG executive vice president Emily Ash. Administrators seem to understand that concern, with repeated reminders that a Title IX report does not warrant a disciplinary process and promotions of confidential resources, including counselors at Counseling and Psychological Services. But even those efforts have come under criticism. 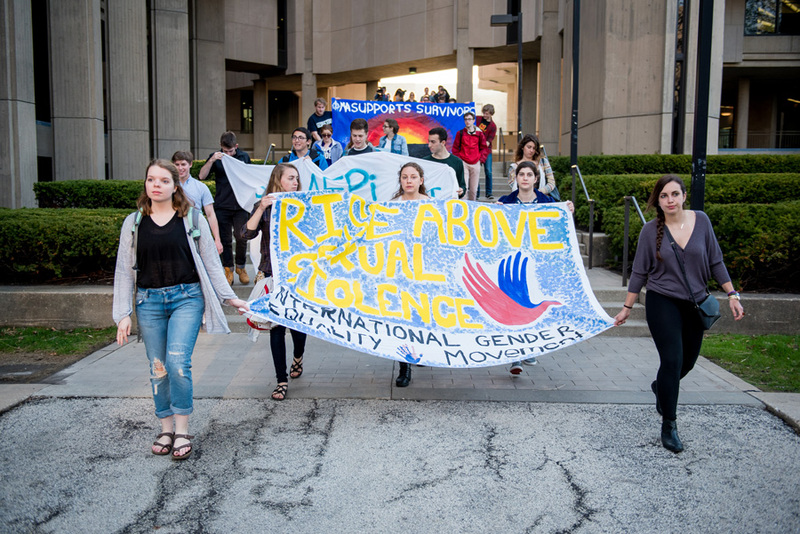 Many students disapprove of the University’s Title IX process, including its recent revision to allow for a possibly extended timeline, and have long called for additional funds to the Center for Awareness, Response and Education, which currently sits without a director. Patricia Telles-Irvin, the vice president for student affairs, said last week that NU would seek out candidates for the position. Student affairs staff has always bore the brunt of student support — many report understaffing and a high level of work. With the top-level University leadership increasingly weighing in on issues affecting students, the question is what role they take in that support. As for holding perpetrators accountable, administrators say there’s only so much the University could legally do. Ultimately, however, student leaders have taken much of the responsibility, and don’t see much of a role for direct support from Northwestern administrators. “Student leaders such as myself in survivor-centric advocacy groups have and will continue to urge the university to increase their support for CARE, and I believe that this is the only way for higher-level administrators to take part in these efforts to address students’ concerns,” Singh said.